We get our hands dirty (and clean), testing shampoos, sprays, sponges and more. We wanted to find the best kit for this all-important caravan chore. There’s nothing like the smell of shampoo in the morning. Or evening. Well, whenever you get around to it! While cleaning your caravan is often a pain in the proverbial, we all experience that fizzy sense of pride after we finish. Let’s face it. On a beautiful day, you can think of worse jobs than spending an hour or so outside, splashing around. Forget all your fancy caravan accessories. If your tourer's not clean, then you're not looking after it. However, we asked one owner not to clean his Elddis all winter. Sap, road grime, black streaks, tar spots, bird poo, squished bugs and plain old mud. Let's get to work. Aldi's black streak remover does 'exactly what it says on the tin' and more. It's powerful stuff! Spray on, leave for a minute or two and rinse off; it’ll take anything and everything off between the nozzle and your caravan’s exterior, whether it’s a black streak, muck, grime or more. Unfortunately, our spray bottle released less of a diffused mist and more of a concentrated jet. That meant that the effect of the solution was very much localised. When we rinsed it off, we had clean white runs interspersed with the original dirt, which we hadn’t touched. Interestingly, the streaks were whiter, even where we hadn't rubbed the surface. It makes me wonder if the potion was bleaching the dirt and not removing it. That would be a short-term fix. TOP TIP Ensure you spread it across the area with a quick wipe, before leaving it for a minute or two. Spreading it ensures the remover gets to work on more of the caravan body than just a thin line where the spray has settled. Gurus of gleam, Fenwick’s cleaning products have been on the sponges of caravanners for years, and we had high hopes for the British brand. Just add it to a bucket of water and soap up your sponge before washing your caravan as usual. Unlike some products here, the Fenwick’s stuff does take a bit more scrubbing to get some of the ingrained speckles of dirt. But elbow grease and patience will solve this problem in little time. With a recommended one part cleaner to 10 parts water, it works well on black streaks too. But it won’t eliminate them. Give an area a good seeing to, and you’ll remove 90% of any staining. A canister should last you a good couple of years. 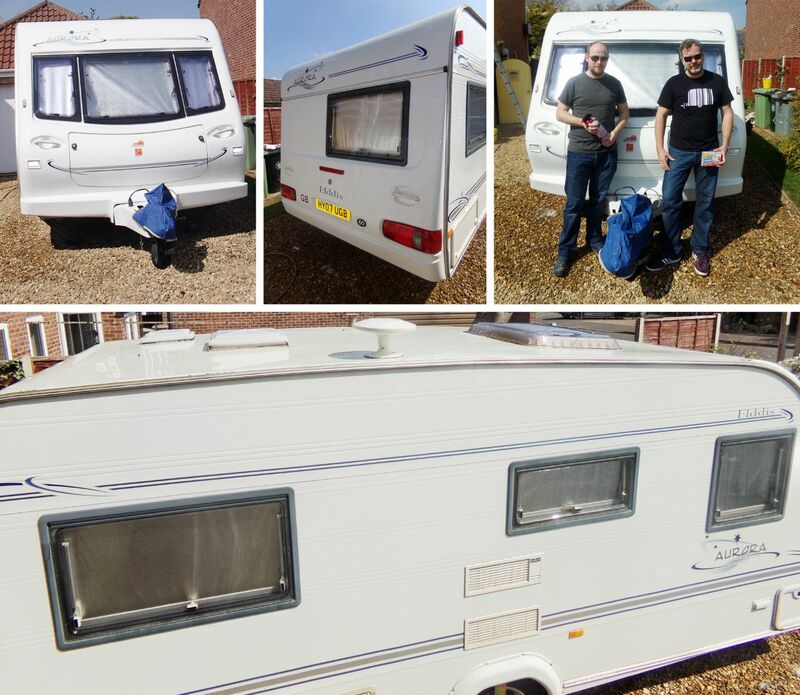 A one-litre bottle will wash 40 average-sized caravans. And, according to the label, it’s uniquely biodegradable, too. Fenwicks claims its product is gentler on the caravan surface, so better for your tourer, long-term. However, we can’t test these manufacturer claims in this one-off test. Cara Finesse makes a wide range of cleaning products. But we’re testing the X1 Wash & Wax. This premium-priced concentrate contains a subtle blend of micro8 polymers (no, us neither!) and high-grade waxes. The makers claim the waxes ‘both cleans and protects’. Just mix three capfuls in a bucket of water and apply liberally with brush or sponge. Alternatively, apply using a pressure sprayer (taking the appropriate precautions). We found the Finesse to be as effective as the Fenwick's brew, regarding the elbow grease required and the polished finished effect. The ease of application made it a faster and easier solution to use than the Aldi formula. Although, there is quite a price differential. We don’t want to sound like an advert. But, Muc-Off is seriously good stuff when it comes to cleaning performance, ease of use and versatility. In action, it’s more like a speed detailer. You spray on and wait for a few minutes before rinsing or rubbing off. However, when it comes to this pink liquid’s results, it deals with all the grime and grease, car fumes, moss, rust, bugs, algae and stains that Mother Nature can throw at it. It seemed to return the caravan panel to a whiter shade than any other cleaner. And the finished effect looked polished with minimal effort. It’s great on black streaks, too, and can tackle the plastic waste pipe covers. They are notorious for getting dirt dug deep into their dimpled surfaces. Its biodegradable formula and alkaline base mean that this degreasant is also good for the environment. Plus, it smells great and stands out regarding looks. When it comes to minimising the manual labour required to clean a caravan, you can't beat it. The only real downside is that it won’t last as long as some of the ‘dilution’ cleaning products out there. But it’s fast and effective. TOP TIP Spray liberally in tight areas that the sponge won’t reach to loosen hidden grime before rinsing off. The prices at Aldi and Lidl do make you wonder how everyone else charges so much. That's especially when the budget products put in a strong performance. This cleaner is effective. But it does take substantially more effort than the Muc-Off product, especially on tree sap and algae. We found that a sponge was more effective than a brush with this formula. You could apply more pressure directly to the dirty areas. If you’ve got more time than money, the Aldi cleaner is OK. But, for the time-poor, cleaning an entire van with this product could add an hour or more to your endeavours. The home-grown giant of all things spotless, Autoglym boasts that you can use this deep cleaner not only on bodywork and trim but on upholstery and interiors, too. That’s great news. But we’re testing exterior cleaners. But that’s not likely to be the case. This established brand nailed the dirt removal first time. Although, it did take a little bit more elbow grease than the Muc-Off, especially on tough black streaks. The impressive performance matched the premium pricing. And you will be pleased with this product if you have committed to Autoglym’s strong heritage and brand values. TOP TIP As with all cleaning products, we recommend pre-wetting the surface a few minutes before you start, to soften the dirt and contaminants. Bailey Caravans endorse this quick and straightforward caravan cleaning solution. Like the Muc-Off and Autoglym, you can use it without water. Although we would always recommend pre-wetting the surface to soften dirt, and regular rinsing to prevent minute scratching. The makers reckon you can use it anytime, rain or shine, day or night. And they claim it leaves a durable shine that repels water for up to three months. Regular washing with this solution also helps to prevent the adhesion of bugs, tar and general grime, making future washes even easier. Care-avan is safe for use on metal, GRP panels and acrylic windows. We found it worked well on light dirt and the tougher stuff. And it removed 95% of black streaks. It’s right up there with Autoglym and Fenwick’s in the (lack of) elbow-grease stakes. But it is quite pricey in comparison with some here. A reader on our web forum recommended this magic little loofah. And it is brilliant at cutting through even the grimiest of gunge with just a little water. Boasting no chemicals, no fumes, no toxic rubbish and no mess, the Erase Away sponge is hard to fault. It seems it will clean anywhere effectively: main body panels, awning rails, outlet covers – you name it. It’s recyclable, too, meaning that it’s probably the greenest of all cleaning products on test, which is a bonus. Made of melamine foam, the Erase Away is very finely abrasive. But always test it on an inconspicuous spot and don’t concentrate too hard on one particular area. Best avoid the windows as well or at least be wary. We found it to be at least twice as effective as a standard wet sponge. The only other downside is the little pad’s size. Filth from the caravan will gunk it up pretty quickly. Still, all it takes is a small wash to wash off the excess dirt before you carry on amazing yourself with what this cleaning cuboid can cope. We reckon a pack of two sponges will clean an average-sized caravan. But, by the time you finish the sponges will be no more, as they gradually disintegrate with excessive use. Still, it blew us away, and we felt that a few quid is a small price to pay for the effectiveness and time saving these smart little pads deliver. TOP TIP Use this delicately on decals, and it’ll bring them back to their former glory in no time. All of these cleaners do a decent job. Some make it a lot easier than others. And two stand out from the crowd. As caravans are so big, it’s easy to ‘run out of steam’ halfway through a job – in fact; it’s almost inevitable. That means using a very effective cleaner is even more important than when, say, cleaning a car. Some of these cleaners took literally half as long as others to achieve a gleaming surface. That means cleaning an entire van could take up to two hours more with the worst performers. The Aldi products are very cheap and do a decent job. But they are, arguably, half as effective as the best here. More time, more effort. The Fenwick’s, Autoglym, Care-avan and Cara Finesse products are excellent. And they are very evenly matched regarding effort required and effectiveness. We recommend them all so price may be the defining factor. The Erase Away sponge is miraculous regarding speed and effectiveness, and it’s excellent for detailing around lights and trim. But, at the end of a very long test, one solution stood out. It cleaned like those adverts on TV where one swipe leaves an (almost unbelievable) gleaming arc across a dirty surface: Muc-Off does it for real and leaves a finish that looks pre-polished. It’s fast; it’s effective. I’m lazy. I love it.